Palm Sunday or Entry into Jerusalem, in the Church calendar Christians is one of the most joyous holidays. On this day believers remember how Jesus before his final Passover, came into Jerusalem on a donkey. Date of palm Sunday is passing, but this holiday is always celebrated exactly one week before Easter. Why is it palm Sunday? According to the Bible, when Jesus entered Jerusalem, the people joyfully greeted him: singing songs, the way strewn with flowers and waving palm branches. In Judea, the palm tree symbolizes virtue and closeness to God. However, in our area, this tree is rare. Therefore, branches of palm trees, it was decided to replace the palm. This tree first comes to life and blossoms after the winter. Hence the occasion and the name – palm Sunday. His celebration was introduced by the Christian Church in the 4th century. In Russia the holiday came only in the 10th century. The ancient Slavs on the eve of preparing palm branches in a special way. They were going to break the willow that grew exactly on the banks of the river. If the weather conditions are not conducive to the flowering of a tree, the branches previously placed in the water to for the festive day they blossomed. This tradition is still alive. This tree has long been revered by the Slavs as sacred, and its branches were endowed with magical properties. Our ancestors had a tradition to beat each other sanctified by the willow, saying, "Verba whipping, beat to tears. Do not beat me, and willow. Be healthy, like willow." It was believed that this tree is able to convey the power, beauty, and health. In addition, on palm Sunday the kids woke with beam consecrated willow, saying: "Verba red, beat to tears and be healthy!". If the children were ill, bathed them in the water, which had previously lowered the consecrated willow. Palm earrings is also attributed healing properties. For example, to cure fever, had swallowed nine of these earrings. Yet they are baked into bread in order to protect. Consecrated willow branches must be stored throughout the year until the next holiday. To do this best for the Church the images (icons). They can also be attached to different places of the house. Our ancestors believed that they protect the house from storms, lightning and thunder, but also from evil forces. It is believed that their magical and healing properties of willow saves throughout the year. If the holiday you have left of last year's branches, do not throw them in the trash, and burn. They can also throw a stream or river, but not in standing water. Lake and pond for these purposes is not suitable. 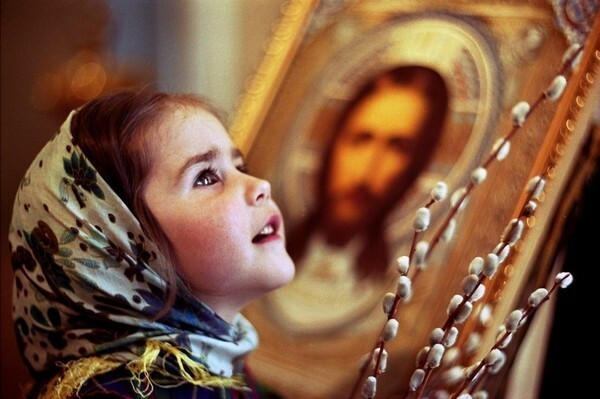 As in any other Orthodox holiday, palm Sunday to visit the Church, to think about a high. This day is recommended to abandon household chores, watching TV and the Internet.